FRANKFORT (April 11, 2017)—With highway construction season kicking off in April, orange barrels and freshly laid blacktop have become a common sight throughout the state, but the Kentucky Transportation Cabinet (KYTC) is also paving the way this spring for one of nature’s black and orange phenomenon: the monarch butterfly. In addition to continuing the Cabinet’s traditional planting of wildflowers along state roadsides, KYTC agronomists will be establishing monarch butterfly habitats—called waystations—for the diminishing species. Last year, the Kentucky Department of Fish and Wildlife and the Kentucky State Nature Preserves Commission brought together over 40 government agencies for the Kentucky Monarch Summit in Frankfort. At the event, KYTC personnel recognized a multipurpose opportunity for using state right-of-way: creating scenic public landscapes that also serve as habitats for monarch butterflies. The monarch, famous for its migration from Canada to Mexico, is the only butterfly known to make a two-way bird-like migration, a mystery that baffles scientists. Over the past two decades, the monarch butterfly population has dramatically declined by 80 percent. 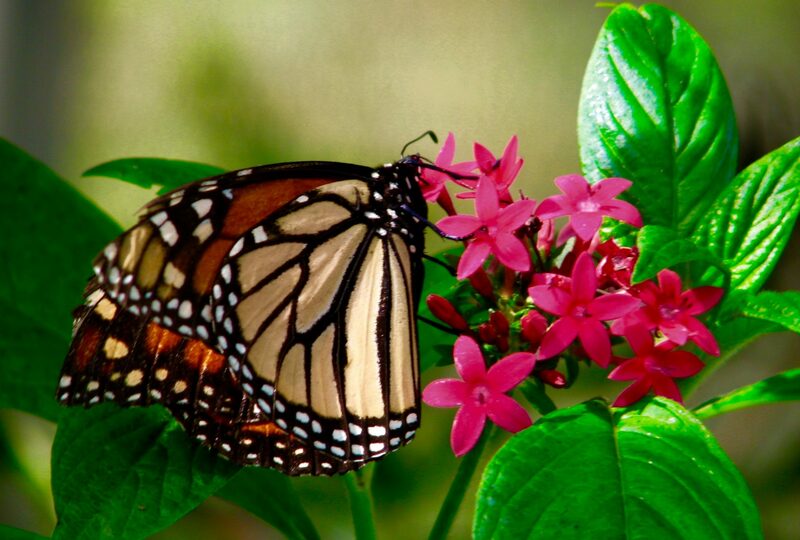 The destruction of milkweed in natural habitats is largely responsible for the demise of the monarch butterfly, which lays its eggs exclusively on milkweed plants. In addition, monarch caterpillars eat only milkweed, so without milkweed, monarchs will not survive. The butterfly species may be listed as endangered or threatened as early as 2018. Transportation Cabinet agronomists plan to establish monarch waystations—10×10 or 10×20 habitat plots—at all rest areas and state welcome centers this spring. The monarch habitats, composed of common milkweed and nectar-producing plants, will provide spaces for monarchs to lay their eggs and to refuel during their two-way migration. Without nectar, adult monarchs cannot replenish the energy supply needed for their long migratory trip. Nectar from the waystation flowers will also attract a variety of pollinators—including bees and hummingbirds—a benefit that fulfills a component of the Kentucky Department of Agriculture’s (KDA) Pollinator Protection Plan. As a stakeholder in KDA’s plan, the Transportation Cabinet will increase pollinator habitats with its waystation and wildflower plots on state right-of-ways. Wildflower bulbs planted along roadsides last fall and additional seeds planted this spring will produce splashes of colorful blooms—including lavender, orange, purple, blue, red, and yellow—to attract pollinators. Wildflower patches will create approximately 120 acres of scenery across the commonwealth. Daffodils began blooming early this year in districts 5 and 10 because of unusually mild late-winter temperatures. Additional wildflowers will bloom statewide throughout the spring and summer and into the fall. The wildflower patches, along with this year’s new waystations, will beautify the state, contribute to pollinator conservation, and preserve the pathway for the highly recognized black and orange butterfly whose existence is threatened. For more information on monarch waystations, visit monarchwatch.org. Connect with the Kentucky Transportation Cabinet at http://transportation.ky.gov/, www.facebook.com/kytc120/ or https://twitter.com/KYTC.